This is one I have on my list to look for... but never turns up at the book sale. May have read it years ago. I need to catch up on reading / rereading her mysteries. Very nice review. I agree, Yvette, if you cannot remember it doesn't count. I read many, many Agatha Christie books at some point bu there are only a few I can remember specifically. Which is a good thing. No it doesn't Yvette - there has to be time for fun too, always! the Generator checked, Cable lines are OK.Been cutting back branches in drive way and mulching. Last grass cut and Leaf blowing every other day. I am done at 79.THINKING OF SELLING ! Yvonne, you should think about North Carolina. NO BIG SNOW and yet you still get a change of seasons. My daughter and her family moved down there and love it. Lots of 'Northerners' down there, I'm told. :) At 79 you shouldn't be having to do so much work. :) Well, at least you get to cuddle up under the covers during the cold winters and do lots of reading. 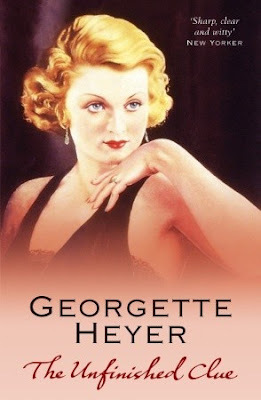 If you like Agatha Christie, you'll like Georgette Heyer's mysteries. Still got to read a Georgette Heyer, Yvette. I know her books have humour too, and I like them that way. I like my mysteries with humor too, Prashant. Wait, you already knew that. :) If you see a Heyer mystery in your book store ramblings, grab it. I haven't read this particular Heyer mystery yet, Yvette - key word in the sentence is "yet." Looks like another add to Mt. TBR. I have read several others by Heyer - the ones that stand out in my mind include "A Blunt Instrument" and "Envious Casca." She does write with wit and style, and her plots are intricate enough to be really enjoyable. I'm not as fond of ENVIOUS CASCA as is most everyone else because I figured out the killer almost right away. That kind of spoils it for me. But I still enjoyed the coziness of it all. I know I read A BLUNT INSTRUMENT but of course, I can't remember. So I'll be reading it (or listening to it) again at some point.